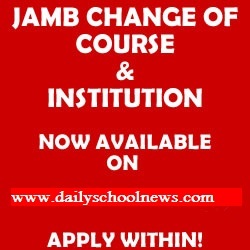 We have received several questions from jambites, asking if they change the course, institution which they first added while registrating for JAMB. The Dailyschoolnews professional and trained staff are currently helping candidates to change their 1st or 2nd choice courses or institutions. We decided to start this service, after we have received several e-mails, sms, phone calls from candidates asking us to help them change their 1st or 2nd choice courses or institutions. Please note that the changes we made are official and authorized by JAMB as they done to reflect on Jamb Result Systems immediately. Here are some few reasons why you may want to change your Course or Institution, we will just mention a few. Is this Why You Want To Change Your Course or Institution? Most atimes, after the release of Jamb results, the next thing to face is post-UTME and admissions issue. Peter applied for a federal university which probably fix a cut-off mark of 200 and above, now after Peter st for the JAMB exam, and the result was released, peter found out that he scored less than 200, this simply means that he has lost the admission he's seeking into the Federal University. So in a case like that of Peter,the change of institution to a state-owned/private University becomes necessary and the only legal way to get admitted. We are also sure that you are aware that State universities generally fix cut-off marks below 200. Yes, just like the first case study, which we tagged IssueLevel 1, this occurs when a candidate chose a very competitive course like any of the following mentioned below. Since we have been doing the change of 1st or 2nd choice courses or institutions, we know that there are several courses which have greater number of applicants than others and such courses invariably attract very high cut-off marks, probably to get only the best students. To avoid being left aside a candidate is advised to go for change of course within the same institution or faculty. In cases like this, (Incomplete O'level Results) candidates who may have ran into deficiency of required credit passes in some key/relevant subjects may decide to go for change of course to accommodate themselves and get admitted. Made some mistakes during registration. Did you made any mistake while filling your jamb registration form, by either you or the business/cyber cafe? All thanks to JAMB, with this change of course or institution, you can now correct any errors made during registration of your course or institution, either the 1st or 2nd choice. Will I get a new photocard? You will be provided with a new photocard, which will be emailed to your box where you can print at anytime you want without limits. Can I change both Course and Institution? However, note that this service is ONLY within the 2 week Stipulated period given by JAMB. Can I change both for 1st or 2nd Choice? You are allowed to change both 1st and 2nd choice. But please note that after a stipulated time, you will no longer be able to change your 1st choice. When will 2013 Change of Course/Institution Stop? weeks after it has started, change of course for jamb 2013 might start from wednesday, the 8th of May 2013. To contact Dailyschoolnews Capable trained and experienced team to handle it for you for a small fee, use the link shared below.